Grand Canyon 8mm films from the World in Color series of the 1940s. 2 theatre Quality film on Eastman Kodachrome film. Estate purchase. These two 8mm movie reels contain scenes of the Grand Canyon. They were produced by World in Color of Elmira New York. Each film is in its original box. Each side of the box contains statements about the films. Those statements are: "Color Editions, Printed on Eastman Kodachrome Film", "8mm, 50 Ft. Aprox. ", "Superlative Pictures of Theatre Quality". One states "Grand Canyon, Reel 1, Fred Harvey, Kodachrome", the other states "Grand Canyon, Reel 2, Fred Harvey, Kodachrome". Inside each box there is a small brochure that lists all movies in the 'World of Color" Series. The brochure also lists the original price of each film. These Grand Canyon films originally sold for $7.50 each. About the date of 1940s that I used in my title, I researched this series trying to find a website stating the date each was produced, but had no luck. 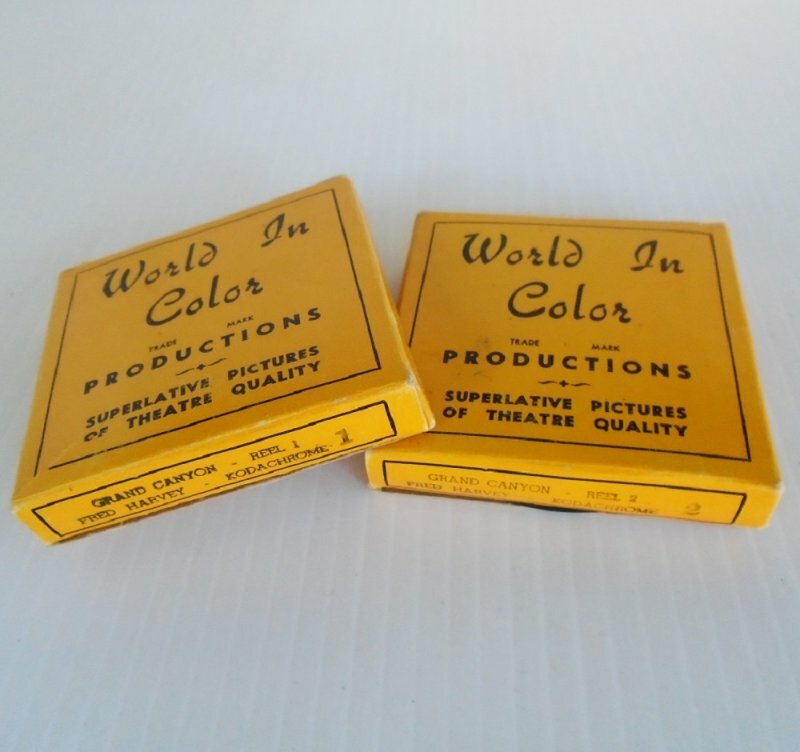 The closest thing I found was a statement saying that most all World In Color 8mm films were made in the 1940s with just a couple from the year 1950. So, odds are real good that these two are from the 1940s. Lastly, I have not viewed these films because I do not have an 8mm projector. I removed each reel from its box and visually inspected it and both look to be in excellent condition. I hope the previous owner put the films back in their respective boxes but since I obtained them at an estate sale, there was no one to ask. As a result, this listing is a non-returnable purchase.